Having a system in place for how I pay our bills keeps us from forgetting about them and having late payments. 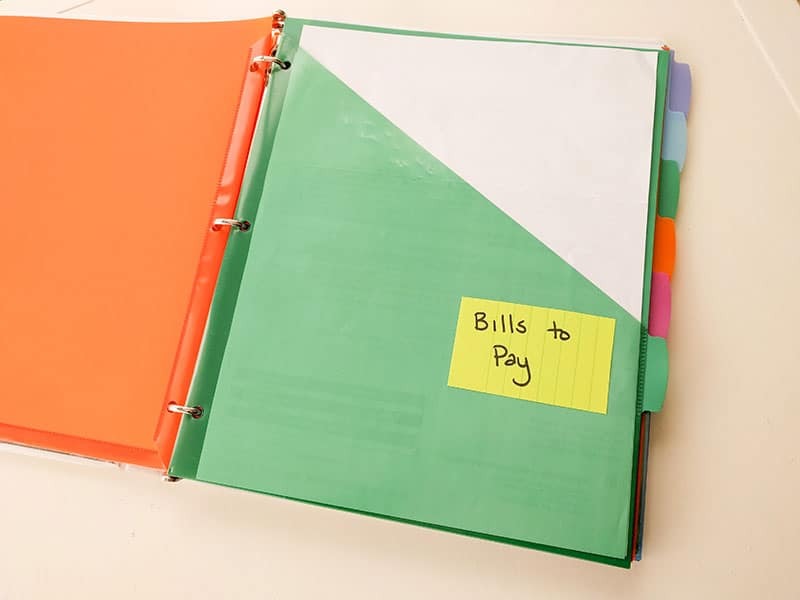 My system also helps me locate any past bills quickly, which has been helpful in many situations. Wouldn’t this be so cute in illustrated children’s book format? No? Ok, then. As bills come in the mail, I immediately place them in a designated folder in my homemaking binder. They all collect there. You can read all of the details about my DIY homemaking binder here + grab the free printable packet to make your own. Since we stay a month ahead of our budget, I find it easier to wait for all of the bills to arrive so that I can pay them all at once. I write down in my planner to pay the all of the bills on a certain date. Usually, I’ll look the through the bills and pick a date a few days before the first one is due so that everything will get paid on time. 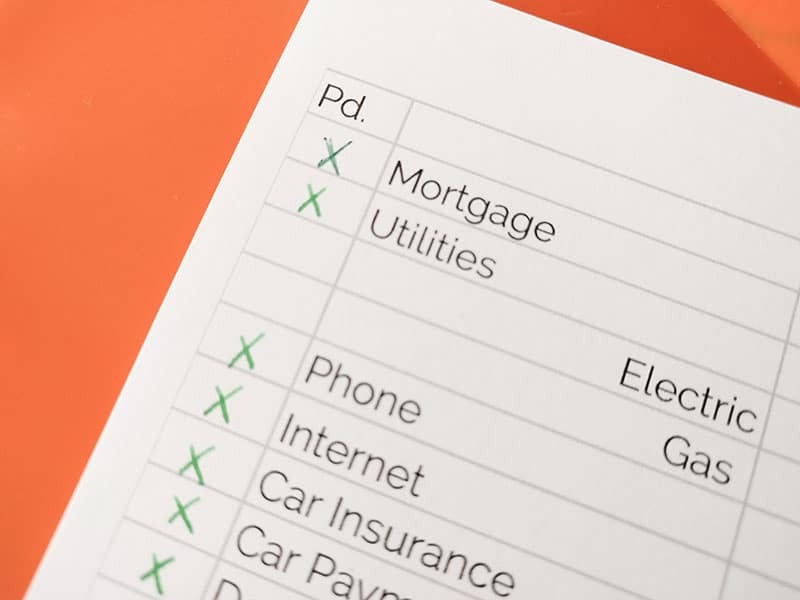 If you don’t pay all of your bills at the same time, you could write in your planner what date to pay each bill according to when you get paid and will have the money for that bill. However you do it, writing down the date to pay bills in your planner will ensure you don’t forget. I’ve come close to forgetting to pay our bills a few times when I haven’t written it down. On bill pay day, I gather all of the bills and pay them all at once. I don’t like giving companies access to my bank account, which is why we don’t set up automatic bill pay through each company. Instead, we use our bank’s online bill pay feature. I just have to go in and tell the bank how much money to send each company. Sometimes they can electronically send the money. Other times they send a physical check (and I don’t have to pay postage!). Once the bills are paid, I check them off on my monthly budget spreadsheet. This helps me make sure that I didn’t miss anything. You can get access to my monthly budget spreadsheet by entering your info below! We don’t receive a monthly bill for our car payment, but it’s listed on the budget spreadsheet. There have been a few times that I’ve looked at my budget spreadsheet and realized that I hadn’t checked off that I paid that yet. Without checking off all of our paid bills on the spreadsheet, I could easily miss something. I also write a checkmark on each paper bill along with the date that I paid it, so that there is no confusion. Next, I put all of the paid bills in a different folder in my homemaking binder, labeled “To File”. Sure, I could immediately put all of the bills in the filing cabinet but I’m lazy. I put everything in the “To File” folder for now. If I need to find a paid bill, I know that it has either been filed or is sitting in that folder waiting to be filed. There is no where else it would be. Once the “To File” folder get quite full (usually every few months), I pull everything out and file it in our proper filing cabinet. I go through the fling cabinet about once a year to get rid of anything we no longer need to keep. 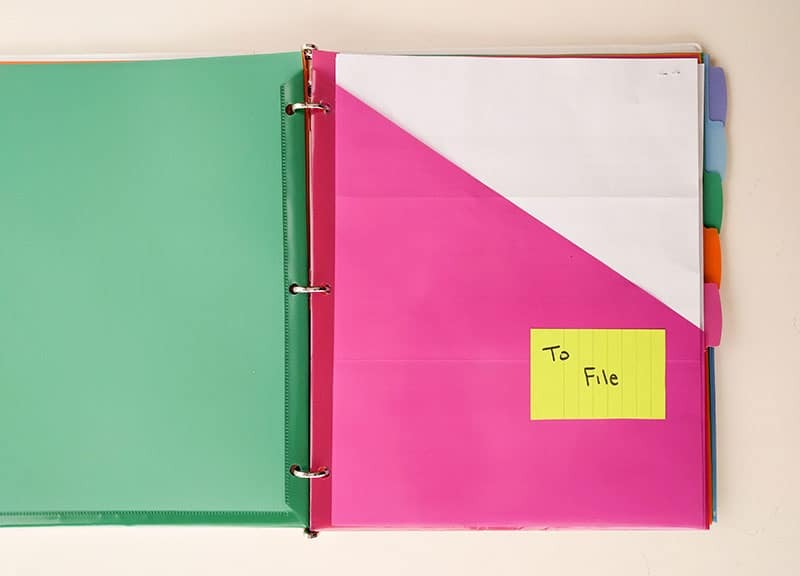 Sidenote: I have colored file folders similar to these. 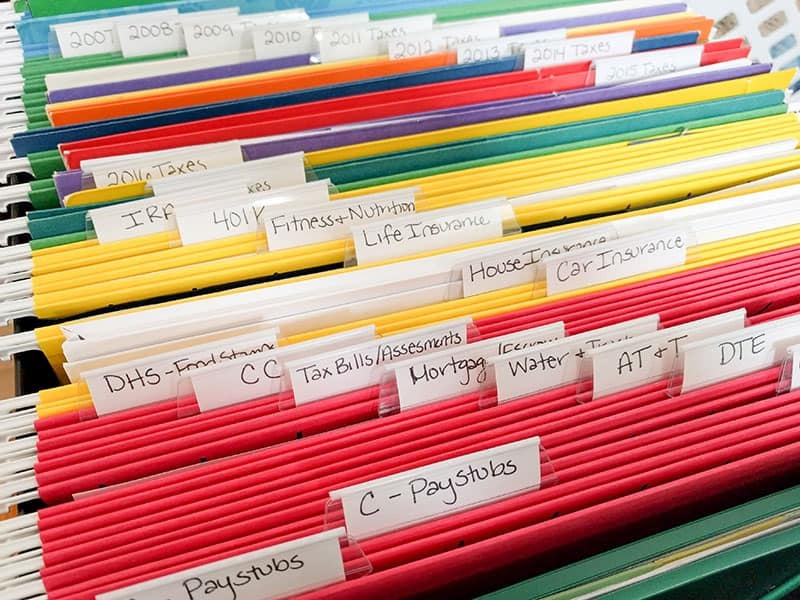 Small systems, like how I pay the bills, are vital in keeping us organized. We don’t forget about payments and pay things late. Also, I don’t stress about when it needs to be done or if I’ve already done it. I hope seeing my system is helpful for you. I always find that I am inspired when I see what someone else is doing and can choose parts to adapt for myself. 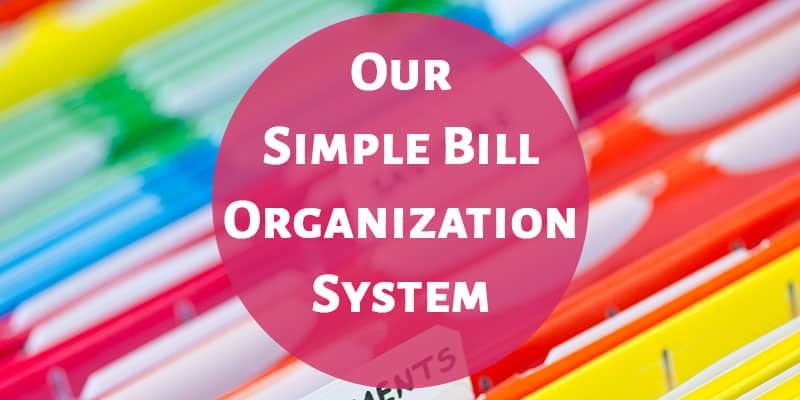 ⇒ Do you have a bill organization system?